Nature and wildlife abound on Phillip Island, a family-friendly getaway less than two hours from Melbourne and home to the famed Penguin Parade. San Remo is the gateway to Phillip Island, and the last town before leaving the mainland. The local fishing co-op is hard to resist, with its fresh lobsters and just-caught fish. Greet local pelicans as they come in to feed at the wharf at the same time every day. The first town on the island is the small fishing village of Newhaven, a popular place for fishing from the pier. Cape Woolamai is a stone’s throw away, with its rugged clifftops and excellent surf beach, and Churchill Island is a living local history lesson. On the south-east tip of the island is the quiet village of Rhyll, where koalas can be viewed at close range. Wander along the boardwalks at the Rhyll Inlet wetlands as exotic migratory birds stop by on their way around the globe. Cowes, the main commercial centre on Phillip Island, is home to the world famous Grand Prix circuit and hosts the annual Moto GP and V8 Supercars. The town’s cafes, pubs and restaurants buzz over summer and during events. The north-facing main beach is an enticing place for the whole family to swim, picnic, or cycle around. No trip to Phillip Island is complete without a visit to The Nobbies to see seal colonies lolling on the rocks, and to Summerland Beach for the famous Penguin Parade to witness little penguins as they make their way up the beach at sunset. 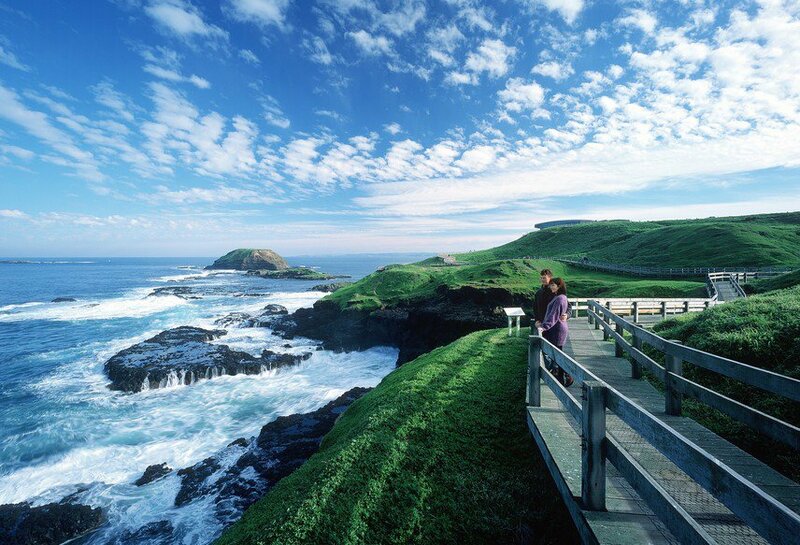 Phillip Island is around 125 kilometre from Melbourne, or an hour-and-a-half by car along the M1 and the Bass Highway.